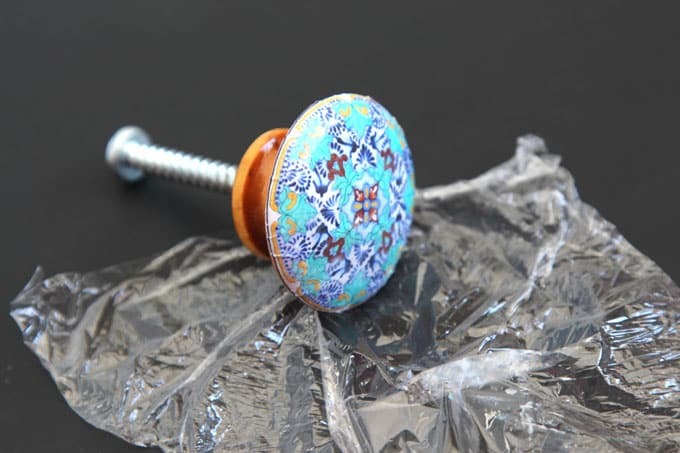 Well, these may look like hand painted ceramic drawer knobs, but the secret is- they are the easiest things to make, and there is no painting involved. Check out the 2 minute video tutorial below on DIY Anthropologie knobs, or skip to step by step instructions. Wood, metal or ceramic knobs. 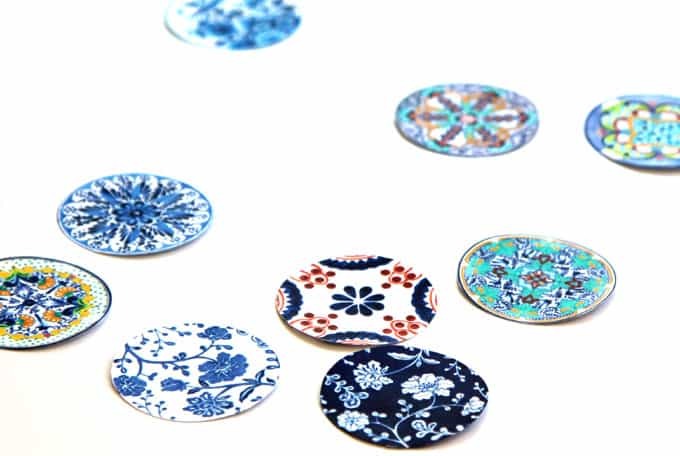 I used 2″ wooden ones with a gently curved surface like these , or 1.75″ ones like these, which are easier to decoupage. 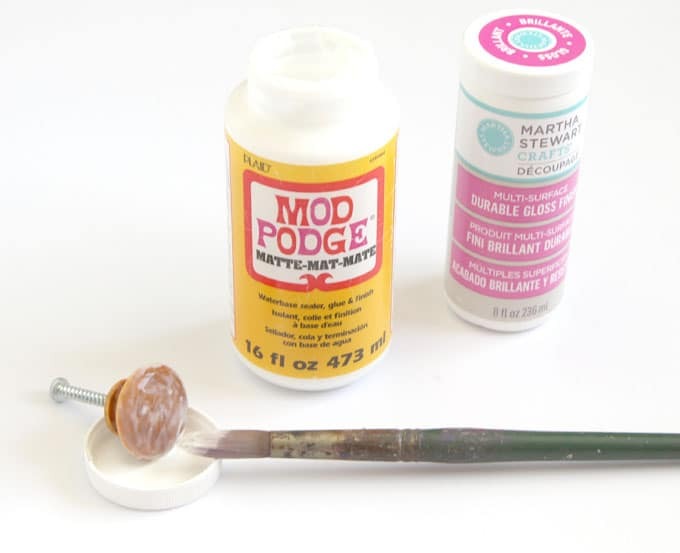 A non-toxic glue good for decoupage, such as good old Modpodge, or Martha Stewart Decoupage Formula , and a soft brush. 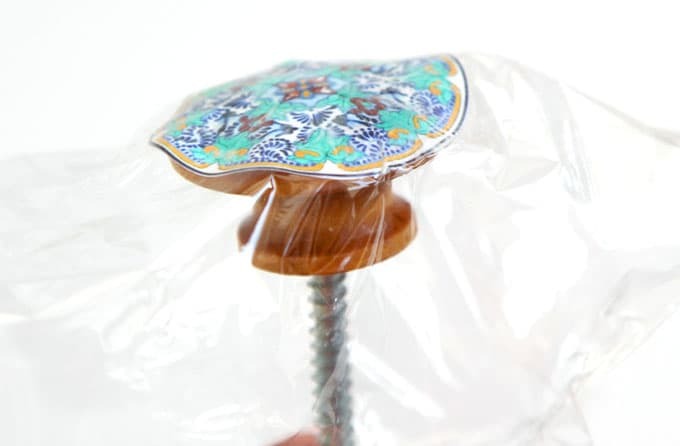 The Martha Stewart Decoupage Formula is dishwasher safe after 28 days, which offers extra protection if the knobs are in high use areas in a kitchen. Office paper and an inkjet printer or laser printer. Most home printers are inkjet. 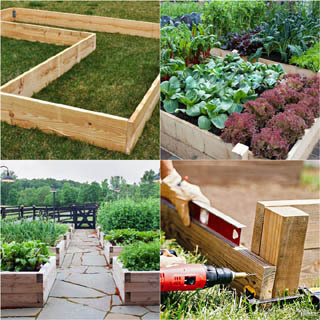 A few thin sheets of plastic will make the process super easy. I used plastic food wrap . Measure the knobs and create same size circular designs. You can download mine at the end. Sand the knobs slightly if they have a glossy coating on the surface. Print the designs and cut out the circles. 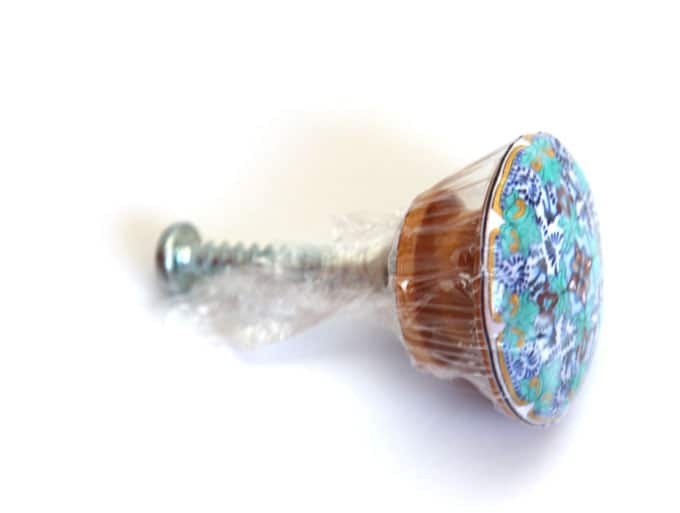 Brush some Modpodge or glue on the surface of a knob. Place a circle with the design side facing down. Carefully center the knob on the circle. Lift the knob (now the paper circle should be sticking at the center) and brush Modpodge gently from the center outward onto the paper. Do this carefully so the paper disc does not shift on the knob. Take a piece of plastic, wrap around the drawer knob as you press the paper and shape it along the curved surface of the knob. Unwrap as soon as the paper is glued to the drawer knob. Finish by sealing each knob with 1-2 coats of Modpodge or other sealers to protect the knobs from finger prints, etc. If you coat the knobs with Martha Stewart Decoupage Formula, it’s dishwasher safe after 28 days, which means- very durable! Now you have some gorgeous drawer knobs, how about choosing cabinet paint colors? 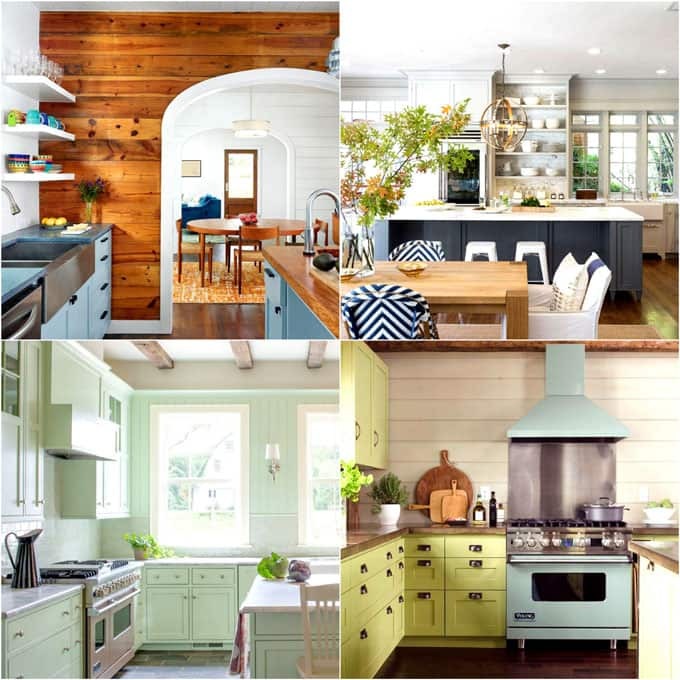 25 Most Gorgeous Pain Color Palettes For Kitchen Cabinets. Aren’t these drawer beautiful? They took less than 5 minute each to make! 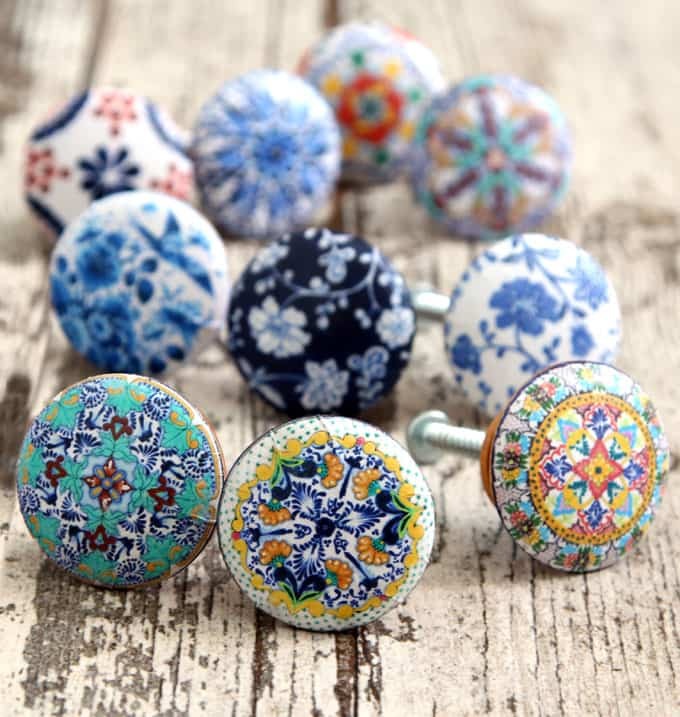 Yes, Anthropologie knobs are irresistible. We are most likely to get some when we move into our new home. However, these DIY drawer knobs are so easy and fun to make, I am no longer itching to run to Anthropologie now. 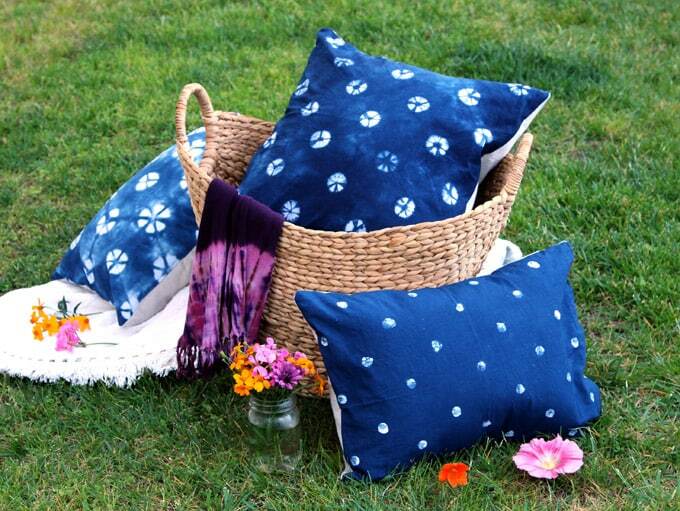 Remember how much I love indigo from these DIY indigo fabrics and pillows? This group below is inspired by blue and white Delft ceramics, the colorful ones by Mediterranean designs especially from Spain and Italy. 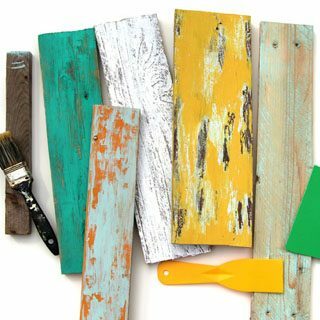 They would look gorgeous on reclaimed wood or painted wood. The designs I made are for 2″ wooden ones with a gently curved surface like these , or 1.75″ ones like these, If you have different size knobs, just adjust the pdf to print at a smaller or larger percentage. The printables are high resolution at 300dpi, which means you can enlarge them to 200% and they will still print out nicely! I love using paper or image transfer for home decor! 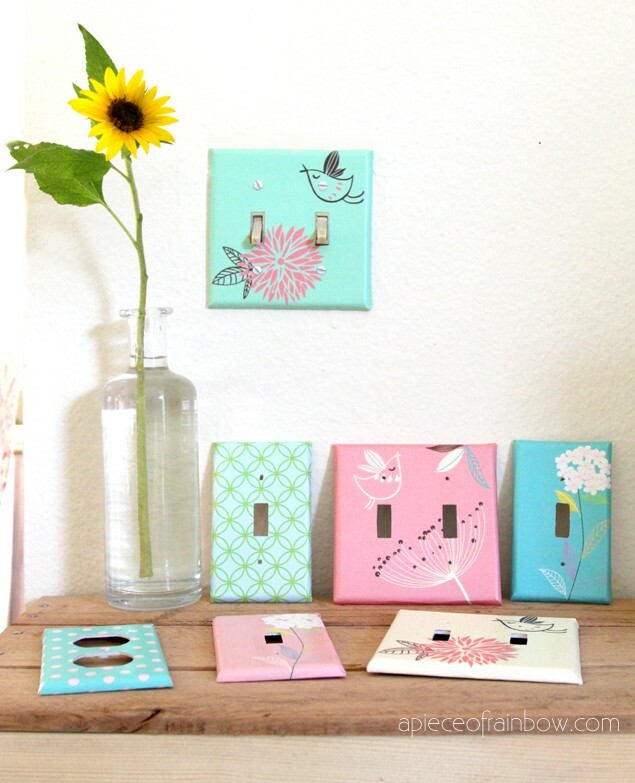 You can check out a similar DIY project: transform boring outlet covers into designer ones, free designs included! 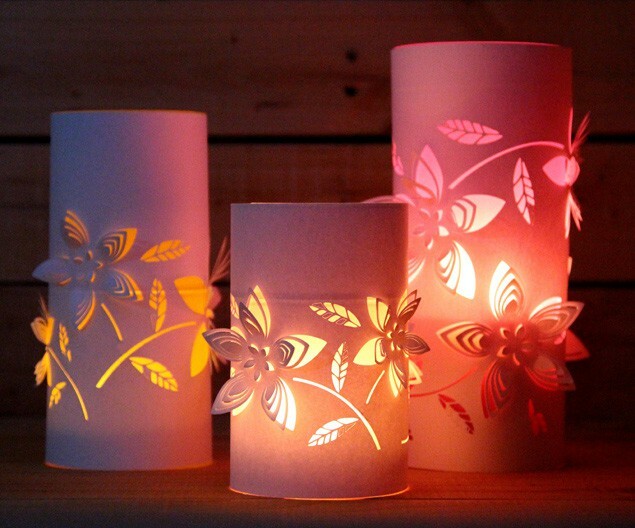 Or these paper lanterns made from up-cycled materials! Wow these knobs are so pretty and handmade is always the best. I have a couple of dressers in desperate need of new knobs. These are perfect and something I think I could actually do! I’m slightly DIY challenged. They are beautiful! These are gorgeous! I can’t believe you made them! I finally have a dresser that can utilize knobs and I can’t wait to go shopping for them! That is such a great idea! 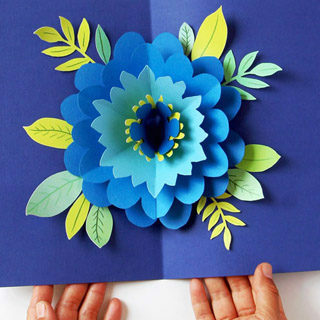 They look so beautiful and this is such an easy project to make! Now I want to go replace all the knobs in my kitchen! Hi there I am very excited about receiling the patterns. We have an old farm house in New Zealand and they are going to look amazing! I just want one pattern so all the kitchen knobs match how how do I do this? Thank you for the designs…and the idea! Super wonderful idea! These turned out so pretty! I’m pinning this. My friend just bought a house and none of the knobs in her kitchen match… I mean not even in a fun boho mismatch way, just in a weird “why are some of these white, and why are some cream?” kind of way. Brilliant!! One of my anthropologie knobs in the hallway just broke and now I need to replace all of them. Thank you for saving me big $$! So awesome! I have been talking about decoupaging knobs for years and finally someone else has done them. I never would have thought to use plastic wrap so thanks so much for that info. Love your designs. Thanks for sharing. thank you lis! this is my first time decoupaging knobs too! lots of fun! We can’t believe how easy this looks and your results are so professional. Next time we need some knobs decorated we will revisit this post. First thing that came to my mind when seeing them was that you used a paper napkin to cover them. (I saw some awesome decorations made out of paper napkins) But this is much easier than using napkins, as they always break ti pieces during process because they are so thin. I saw some ceramic knobs with similar design, but they did cost a fortune. 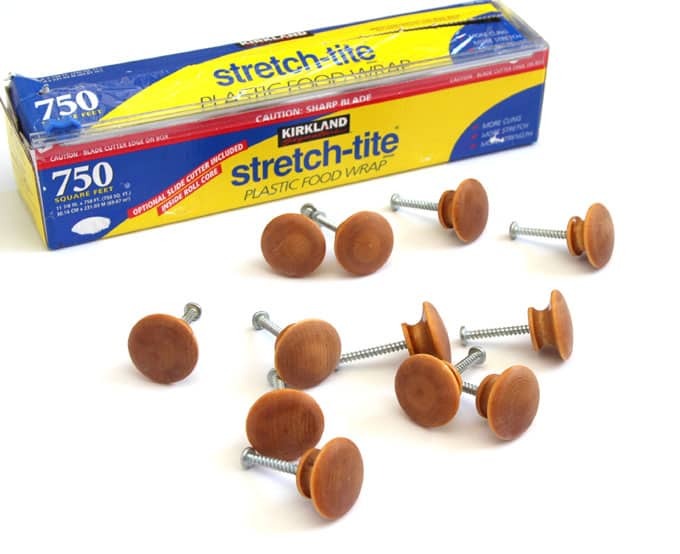 What if we would glue beautiful buttons or leaves on these wood knobs? Would they last? One more thing: I fell in love with your blog and your projects, as they are so inspiring. I wish you have enough time to create all you have in your mind and you want to create. Many thanks for your inspiring work from thousand miles away! 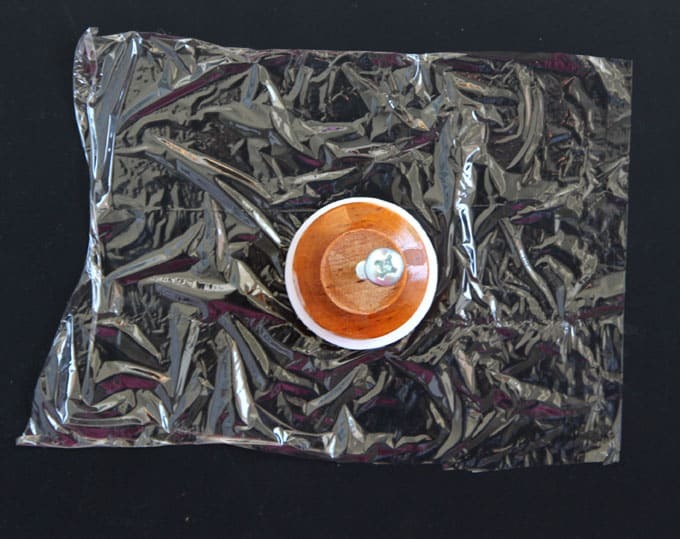 One more thought about buttons: I made them out of painted cork wines and the result was totally unexpected! Definitely, it was my favorite project till now! I think this is just brilliant and so simple. Thank you so much for sharing. Wow! I know, not very original but it’s all I can think…Wow! You are an atrist painter! i m always admiring your handwork… Artist is what you do for a living? these are gorgeous look so real thank you for sharing!!! These knobs are just amazing! And such a frugal way to get such a gorgeous effect! I have a desk that needs a makeover when my oldest gets home from her summer job in August. I think we’ll have to include some of these really cool knobs in our design! thank you, these are so pretty, can’t wait to make some! BUT… don’t test them by putting them in the dishwater! They are made of wood, after all. doesnt seen to be working? I hit the button and my email never came. Please send them on ahead, they are the perfect solution to my boring kitchen! hi! it can end up in junk. the knob designs have been downloaded 2000+ times. Beautiful! I can’t wait to do this. I might paint the knobs a color where unfinished wood is showing. I found this amazing silver paint in a tiny jar from which would be amazing. Hey the link to the printable design is not showing up. Can you send me the link please? Thanks so much for a great idea! I am so excited about making some of these! Thank you so very much for sharing! These are so beautiful Ananda. And they look so high end. I would never have thought that they are just printables. Very smart and creative. I am hosting a new link party called Sweet Inspiration and would love to have you join us. It runs Fridays 10am est to Tuesdays. I’m planning on repainting my kitchen cabinets…the design on these knobs would look wonderful! Planning to build a new house and would love to be able to make knobs like this! thank you! You place the the cut out designs in the knobs “design side down” ? I can not get the designs to download. When I click on the link nothing happens. I love the knobs and want to make some for my cabinets. Help! hi deborah, my site might have been down- it rarely happens. are you clicking the download link in the email sent to you? try it again and let me know if you have trouble! I don’t see a link for the download. These knobs look amazing, I’d love to try it. óla, abençoada, adoro suas artes pena que moro no brasil, se moras ai perto ou ai mesmo onde vc mora viraria fã de carterinha de vc rsrsrsrsrsr, um grande beijo e que deus continue te abençoando pra vc continuar nos passando essas artes belissimas. Cant wait to give this a try! I wonder if scrapbook paper would work as well? They have lots of designs!! Did you spray sealer coat on top of the decoupage ? I think that they would need this because mod podge is not waterproof. Overall though this is a great idea, I will be doing these to brighten up my kitchen. Thank you for sharing. Wonderful.thank you so much for this idea. I was not able to print cause I could not find how to do it. Link please. 🙂 These are so cute. These are very cute. Don’t see a link to download. These are so lovely. Will be doing this! For those having trouble finding the download link, use your phone’s internet settings to request the desktop site, or a non-mobile device. Or perhaps just non-Android device. Thanks for the fab tutorials. I could spend hours here! These are super pretty. 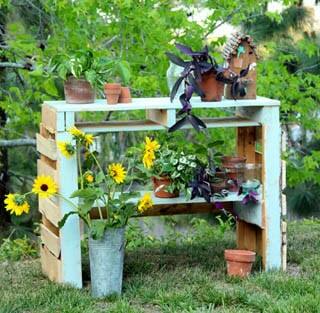 I cant wait to do this for my dresser. I looked and looked but cant find the download you are so kindly sharing to make the knobs. I cannot find the location in the article to download patterns. Please help!!!!! Will someone email them to me? 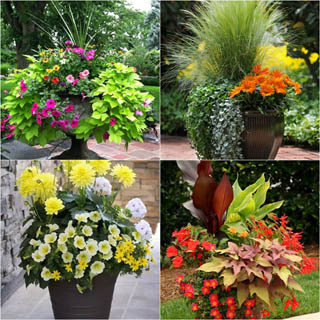 Wonderful idea thanks for sharing! Will this work on stainless steel knobs? Thank you for sharing this lovely idea. I can’t find the yellow download link for the patterns. Awesome knobs!! Love this idea! Will you please email me a pdf of the designs? I was unable to download it. Thanks. I just downloaded these and they are so beautiful. Thanks very much. I was wondering if you could help me though. I would like to make a few of the same design. Would I have to print up the page 8 times or is there another way to get 8 of one design? Thanks! I am not sure how others have downloaded the patterns? Thank you for this fabulous design. I’ve been looking for new knobs for my kitchen but these beautiful designs have transformed the existing ones. I painted them after sanding and stuck the paper disks on with the second coat. A couple of coats of varnish completed them. I’m so pleased with the finish. Hi, I noticed you were able to download the button/knob files. I have tried several times to download using the yellow box that says “click here”. It brings up a box asking for my email info but when I click on download, the app freezes and never completes the link. Is there an alternate address I can download from? I wasn’t able to download the patterns for the knobs. Can you email it to me? Are there sites out there with all kinds of patterns for these? I wasn’t able to find any. Many thanks. They’re beautiful. I look forward to hearing back from you. So authentic who would think is paper. Love all the colors you made. THESE ARE FANTASTIC!! Yes! I’m shouting! Lol. Thank you for posting these! I will definitely be making them. Thanks for sharing. Love it but I am unable to download the link? Do you have a website that can download them. Thanks. Beautiful! 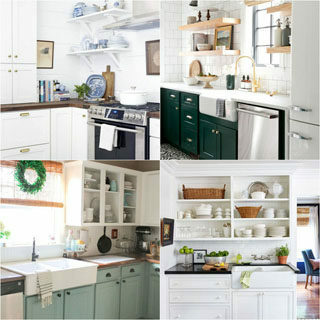 I can think of some cabinets and drawers that are going to get a makeover in my house!! Thank You! I love this idea. 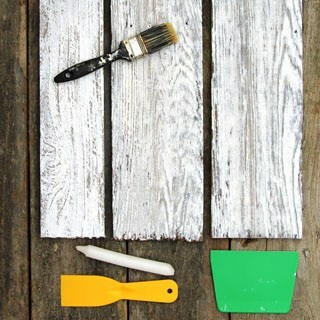 Since I plan on painting my cabinets soon i will be trying this out. By the way, half of my expensive Anthropologie knobs broke, save your money. 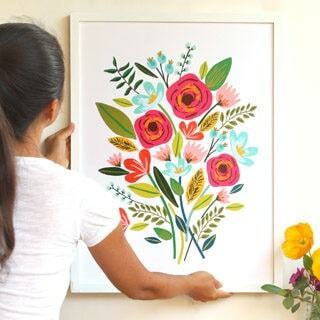 Found via Apartment Therapy- amazing patterns + tutorial! Where have you been. I just found you and I want to be on your mailing list. What a great page. Thank you for the downloads of the knob papers. Made these today. They look fabulous. Thank you for your inspired design. I just love these designs but I can not get it to email them to me. I am on page 2 and hit the yellow button right above the outlet plates. Inserted my email and name and hit send and…nothing. Just sits there and spins. I would really like the pdf! Can you help? hi lisa, sometimes it does that but you should still get an email from us after you hit send. Hi. I have tried several times and on different devices to download the knob designs from your article. However, when I click on the download link, it just brings me back to the page. Nothing else comes up. 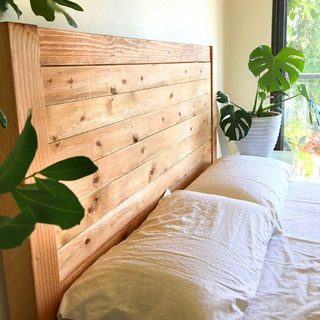 Could you please email me the designs? This is not working, and I really wanted to make these. Thanks! Thank you Ananda for your inspiring blog! Truly amazing! Thank you so much for doing this. Being able to change the size without the resolution getting flubbed up, is such a huge deal! Plus these designs are spectacular! It’s exactly what I was looking for. You just saved me so much in money and time. Thank you SO much these are so beautiful. I recently purchased over 100 wooden knobs at a thrift store for about $8. Can’t wait to get started on them with these beautiful designs. I can now think of so many uses for those lovely knobs. I got the download info but when I don’t get it. Am I doing something wrong. Is there another way to get the download to work. hi mary, did you get the link to download in an email from us? I had so much fun making these knobs. They were easy and beautiful. Thank you A Piece of Rainbow for the templates and tutorial. Delft is in the Netherlands. Lovely little town with gorgeous ceramic designs, but nowhere near Spain or Italy. Thank you so Much! I saw these months ago, and printed them. I used Chalk paint on an old nightstand that had the perfect knows for this. It looks awesomE. I used gloss decoupage medium and they truly look like porcelain ķnobs. 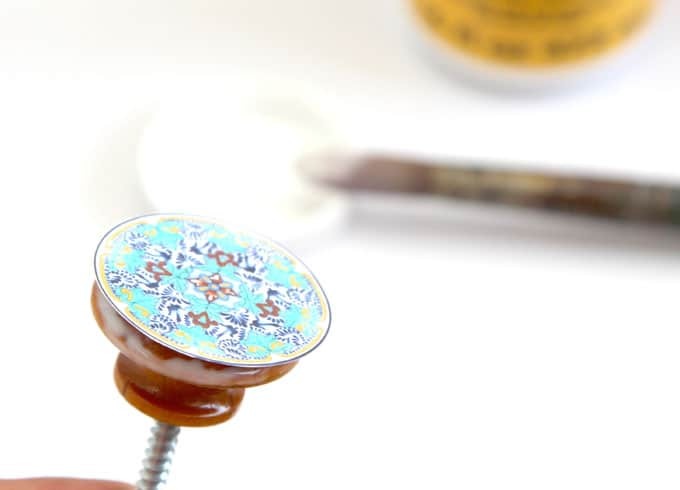 Absolutely beautiful knobs, the look hand painted! Love them. The link for the pdf file leads back to your page and I am not receiving them in email. 🙁 I did check my junk folder, too. Nice, fabric would work great to. Hi! i seem to be having the same issue.. I typed in my email and my name and have not received an email (even in my junk). Please let me know of any other way i could access these beautiful designs! Love it but cant find the down load button? I have been waiting for 3 days and still no email link to download the printable knobs..I have registered and still nothing….please tell me how to get the download. hi amanda! have you checked spam and promotions folders? Hi! These are so pretty! Wondering how much wrinkly/distorted the designs got on the edges (where the knobs curve)- I’m thinking about doing it using stickers with Beatrix Potter scenes for our baby’s nursery, and not sure if the curvature would be a problem. Would love to hear your thoughts! Also, have they held up well with use over the last year? How do I download the prints for the ceramic door knobs? I have sent you my email address and for some reason i can’t get your email and I so want to download the door knob patterns. What is the music in the video? The piano is simple and lovely! I would love to buy it. I have been trying to download several templates. When I click on the download, I get a pop up asking for me to sign up. I am already signed up and fill in the form anyway. I never get the email where I can click to download the templates. It’s not in my usual emails, nor are they in promos or spam. ??? Hi! I’ve tried multiple times to click on the yellow download button, and it doesn’t work. I even tried registering my email multiple times, and clicking the link via the email that was sent to me. Any suggestions? hi! you should be able to do a screen capture and save it as jpeg. or use gimp(free) to make a collage! Hi, I’ve just put my completed knobs back on the dresser – they look great. Thank you for the design. They are so easy to do. These are truly lovely, however, I see no way to download them. I have looked and looked and nothing. Would you be able to e-mail me a copy of the knob patterns. I would be ever so grateful! Thank you. You put that there is a link to download the designs but I can’t find it and nothing takes me to this. Can you please send the link. Thank you so much I love them. Hola, me encanta tu página y estos pomos se ven increíbles, sin embargo no aparece el enlace para descargarlos, también tengo problemas con otros proyectos para descargar ya que no recibo el correo de confirmación para poder acceder a las descargas. Escribo desde España, por favor, me interesa mucho poder acceder a tus maravillosas descargas, pero parece que nada funciona, ¿podrías darme una solución? Gracias y un cordial saludo. I downloaded several mandala designs from the internet and used them to make the knobs on my bi-fold closet doors. First ones looked great until I tried to top them with Delta Triple Thick Glaze…which made the color run. So I scraped that one off and tried various things on paper before redoing the knob; Liquitex Matte Medium and Delta Gloss Varnish both made the colors run, but a spray of ModPodge seemed to be OK. Now I just have to try another sealer top coat product over that to see how to if it actually sealed the color before I reprint and repaste that knob and finish the rest. 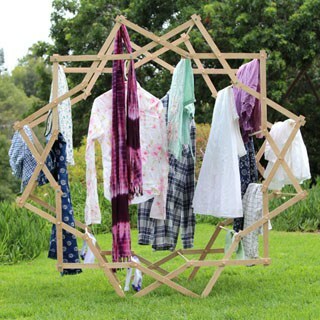 It may be that I will have to go to Staples and have my mandalas printed on the laser printer. I have had trouble with transfers from my inkjet printer before too. Either way, these are easy, beautiful and I can’t believe what a difference they make on the doors! I have a dresser with wooden knobs waiting to be done too! Fun to look for patterns and themes (seashells, anchors, flowers, faces, endless possibilities!!) to put on them! Thanks so much for the tutorial-it’s one of my all time favorites! What a great idea!! I did something similar with scrapbook paper and tiles to make coasters. Would you be able to seal them with an epoxy resin for a solid clear coating? I would be worried that the paper will curl eventually. Thanks! Hello! 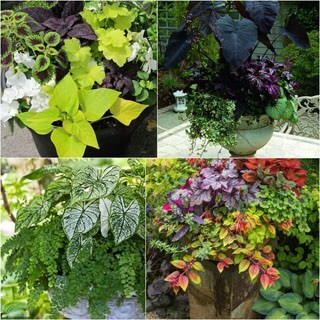 You do a fantastic job with this blog,really.! I loved the anthropology knobs tutorial and looking forward to try your idea. The thing is that I can’t download the template… Could you please help me? Keep doing what you do and thank you for your time ! This is such a fun project and I would love to download the template – BUT- The big button at the end of the newslletter DOES NOT WORK! I even tried re-adding my name to your subscribers, but it still does not work. HELP!!!!!!! 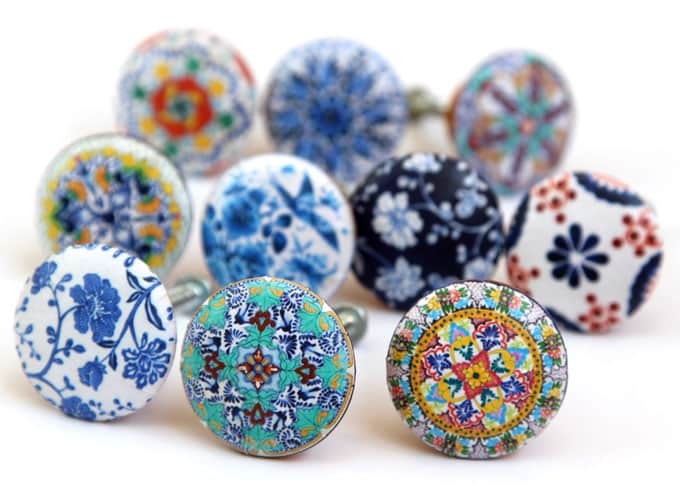 When I was a teenager in New Zealand, my mother hand-painted wooden drawer knobs like those for the dresser and wardrobe in my sister’s bedroom. She painted them white to match the furniture, then hand-painted a rose on each one. They looked wonderful. Now, thanks to you, I can do something like that even though I did not inherit my mother’s level of talent. For some reason I can’t get the download for the knobs! Thank you so much for posting these DIY knob tutorials and the download! You literally saved me $180.00. These are BEAUTIFUL! Thanks so much for the great details. Just go online and find something you like, copy it into a photo or graphic program and cut out circles from it the size you need and print. Thank you so much for this tutorial! I am redoing my kitchen with a southwest theme and was contemplating making knobs using polished colorful stone, but it was going to be VERY expensive. Instead, I printed out 50 different polished stone photos and cut out 2″ circles and used your technique on wood knobs. Finishing them up now and they look GREAT! Wish I could share a photo of them. Thanks again! Sorry. I don’t do instagram!